Kerlabs solutions are built on top of the Kerrighed technology. Kerrighed is an open source operating system which extends Linux functionalities and interface to a cluster scale. Using and managing a Kerrighed cluster is just as easy as using a desktop computer running Linux. By using Kerrighed in our solutions, we benefit from its very unique capabilities. 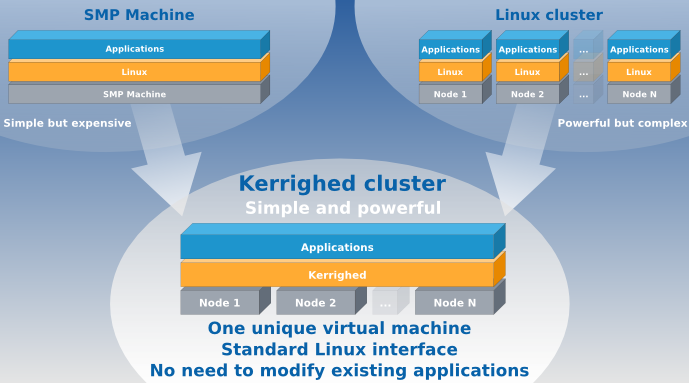 Virtual SMP: Kerrighed offers the illusion that a cluster of PCs is a regular SMP machine. All resources of each cluster node are merged into one unique virtual machine. Thus, you use your cluster intuitively as you do a regular desktop computer. Binary Compatibility: all existing applications running on a Linux machine run on a Kerrighed cluster without any modification. For administators, users and even applications, a Kerrighed cluster is the very same as a regular machine running Linux. Node Addtion / Removal: new nodes can be added to a running cluster at any time. New nodes resources (CPU, memory) are automatically merged to those already present in the cluster. Nodes can be removed at any time without loosing processes running on these nodes: processes are simply moved on remaining nodes! Customizable Cluster-Wide Features: all cluster-wide features can be dynamically enabled or disabled on a per process basis. You can finely tune through a unique and simple command the behavior of your applications running on a Kerrighed cluster. Unique Process Space: process identifiers (PIDs) are unique cluster-wide. Thus, regular commands like ps, kill and top operate on processes whatever their location. Automatic Process Load Balancing: processes can be efficiently migrated to balance the CPU load or to free a node to be stopped for maintenance. Process migration can be done manually or automatically by the Kerrighed process scheduler.